Jim Shoemaker, known as “Shoe” to everyone in our firm, died Saturday, July 14, 2018. We mark his passing with great sadness, but also with great joy in the memory of a remarkable life which he fully embraced and shared with all of us. Shoe practiced law with Wyche for his entire legal career, beginning in 1965 after graduating from the University of Virginia Law School. 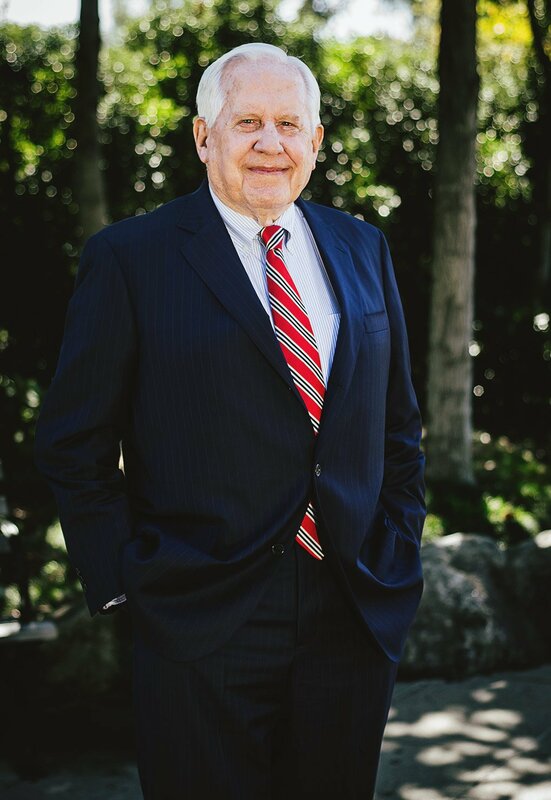 He established our practice in securities law, which made Wyche the first, and for many years the only, law firm in the state handling public-company as well as other sophisticated corporate law and mergers-and-acquisitions matters. Shoe was generally considered to be the best business lawyer in South Carolina. Our reputation as the premier corporate law firm in South Carolina began with Shoe. Remarkable as that is, Shoe’s life was far greater than just his law practice. He grew up as a Navy kid, and occasionally he would recall his childhood memory of being with his mother on the naval base at Pearl Harbor and being strafed by Japanese planes on December 7, 1941. Finishing high school in Norfolk, he went to college at UVA and joined the Marine Corps upon graduation, serving three years on active duty as an officer and then serving four years as a foreign service officer for the State Department before going to law school. Shoe’s service and loyalty to our country was at the core of his being, but it did not preclude his telling hilarious stories from those days, including the 180-degree mistake in artillery practice, the motorscooter mishap in Okinawa, and the experiences with Tokyo locals who did not suspect that the very tall Marine on the subway understood and spoke Japanese quite well! Shoe married the love of his life, Polly, with whom he raised three sons, all now long grown but some of whose childhood clothing is probably still circulating around the firm. He had an active and eventful life in public service, having been elected to the Greenville City Council and later to the Water Commission and thus taking early leadership in the redevelopment of downtown and key participation in the preservation of our greatest natural resource. Shoe was a conservative Republican before that was fashionable, and he exemplified the best ideals of that political philosophy through his practice of social responsibility -- he chaired the state Chamber of Commerce as well as the Greenville Urban League, and he led, worked in, and supported many other civic-service and cultural organizations. Until recently, we could always count on Shoe’s being in the office every day and seeing him and Polly at firm events, many of which they graciously hosted for many years. The two of them were unfailingly upbeat, friendly, and generous. Shoe actively, or just by example, mentored many of us in the firm, and we are better lawyers, and better people, because of that. We will never forget him.